On October 11, 1776, British military forces finally drove the American military from Lake Champlain at the Battle of Valcour Island. Connecticut’s Benedict Arnold had spent the year harassing the British. In concert with Vermonter Ethan Allen, Arnold successfully took Fort Ticonderoga in May of 1775, sending its arms to Boston. Arnold then proceeded to launch an attack on Quebec, which failed dramatically and left Arnold with a wound to his leg. An unsuccessful siege of Quebec City was followed by Arnold’s retreat down to Lake Champlain. With the British amassing a force of thousands of soldiers, Arnold and the patriot forces took or destroyed what ships they could from Lake Champlain hoping to starve the British of the vessels they would need. The final battle of Arnold’s harassing efforts that year would become known as the Battle of Valcour Island. The British had hardly been asleep at the stick during this period. General Guy Carleton had requisitioned and received disassembled ships that were brought to the lake. Expert British shipwrights reassembled the ships to give Britain a Navy on Champlain that included 25 fighting ships and scores of support vessels. On October 10, after a spirited fight, Arnold’s 15-ship fleet was seriously overmatched both in men and cannon as it sheltered off Valcour Island. The British had begun positioning soldiers on Valcour Island to prevent a land retreat, and at sunset on October 10 the battle stopped for the night. Some British ships had literally run out of ammunition in battering the Americans. Arnold’s fleet had played a cat and mouse game, ducking into shallower waters to avoid bigger British vessels, but the outcome was becoming clear. Under cover of darkness, Arnold ordered a retreat. With muffled oars and no lights – and the assistance of a heavy fog – Arnold’s leaky and battered fleet sneaked south to Crown Point. Carleton was furious that Arnold had dodged a final crushing defeat. Thinking the Americans were hiding somewhere at Valcour Island he sent ships to search for them. Then, intuiting what had happened, the British sailed south. With the British fleet bearing down, Arnold began destroying the American ships. The British captured one ship along with 110 men – roughly one-fifth of the American force. The remaining ships were driven on the rocks by Arnold and left in flames, with their American flags still flying. As the British secured the area, they concluded that the season was too late to press forward toward Boston. They would winter over in the area preparing for the spring, which set up the Battle of Saratoga in 1777, and Arnold’s final triumph on behalf of America. 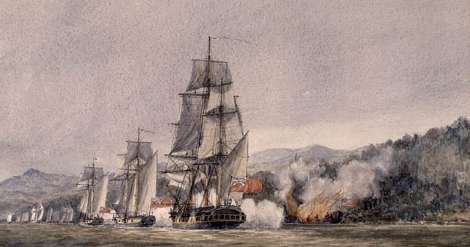 The Battle of Valcour Island was typical of Arnold’s experience. The result had been that his fleet successfully slowed the British advance to give the Patriot cause time to grow. But in the flight he had lost many of his records – which ultimately prevented him from winning reimbursement for the money he spent on behalf of the military during his expeditions. The retreat and loss of the fleet also gave Arnold’s political enemies fodder to use against him. Some even suggested the loss of the fleet in delaying the advancing British was a mistake. Pennsylvania Governor Joseph Reed, Arnold’s chief critic, and Benedict Arnold were in many ways complete opposites, though both were Patriots. Arnold made his way in New Haven, Conn. in the rough and tumble world of trading. Reed was a Philadelphia lawyer. Arnold served as George Washington’s battlefield general. Reed was politician and member of Congress. Reed was famously scrupulous with a keen dislike for any taint of corruption; he had no use for anyone with affection for loyalists. Arnold bent rules to keep his dwindling fortune from being snuffed out completely by the cost of financing the war. And he married a young loyalist wife in Philadelphia. Arnold was shot twice in fighting the Revolutionary War. Reed was never injured in battle; he designed a flag for the navy. Arnold would accuse Reed and his like of refusing to reimburse the costs of war and pushing the promotion of politically connected officers ahead of better-qualified soldiers in the military. Reed would accuse of Arnold of putting his business interests ahead of the Revolutionary cause. Would the American Revolution have succeeded if Arnold and his men had not delayed the British advance, first at Valcour Island and later at Saratoga? Would Arnold have still turned traitor if not for Reed and his supporters badgering him over his bills. Or would Arnold have been lead to support the British anyway, under influence of his young loyalist wife? And what's the best way to balance the power of political leaders and military leaders? It makes a good debate.